Breakfast is an important meal for seniors. They need to have enough fuel and nutrition to enable the body and mind to function properly. 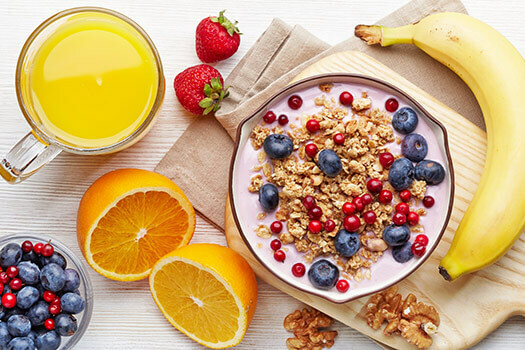 Some need breakfast to regulate blood sugar, while others live with different types of anemia, which requires a continual source of protein throughout the day. There are many simple breakfasts seniors might enjoy that are healthy, easy to prepare, and inexpensive. One egg contains 70 calories, 6 grams of protein, and 250 milligrams of choline. Adults need 0.68 grams of protein per pound each day. This equates to 81 grams of protein for a 120-pound adult. Protein curbs appetite and regulates blood sugar. Choline is necessary for normal cell and liver function, and it also aids in transporting nutrients throughout the body. Eggs also contain B and D vitamins along with various minerals. They can be eaten boiled, poached, or scrambled and combined with cheese, meats, and vegetables. Eating eggs every morning is one of the many ways seniors can maintain their health and wellbeing. Seniors who want to remain healthy as they age can benefit in a variety of ways when they receive professional home care. Oshkosh, WI, Home Care Assistance is here to help your loved one accomplish daily tasks, prevent illness, and focus on living a healthier and more fulfilling life. Adults need 20 to 30 grams of fiber each day to prevent constipation. One cup of cooked oatmeal supplies 4 grams of fiber, 6 grams of protein, and a mere 145 calories. Each serving also supplies 2 percent of the daily requirement of calcium and 8 percent of iron. Adding fresh fruits increases the amount of fiber, vitamins, and minerals. One cup or container of plain yogurt supplies 12 grams of protein, 42 percent of the daily requirements for calcium, and 537 milligrams of potassium. Adding fresh fruit, nuts, or granola increases the nutritional benefits. Yogurt can also be mixed with dried cereal or oatmeal. Low-fat versions are available, and they offer the same degree of benefits. Smoothies are ideal for seniors who have difficulty chewing solid foods. Breakfast smoothies can be easily made using yogurt or low-fat milk as a base and adding a variety of fruits and nut butters. Protein powders can also be added to boost the nutritional value. Smoothies can be made in large batches and frozen in individual servings for later enjoyment. Some seniors require assistance with meal preparation and other day-to-day tasks. If your aging loved one needs occasional help with bathing, grooming, cooking, or other basic household tasks, or if you need time to attend to important personal matters, reach out to Home Care Assistance, a leading provider of live-in and respite care. Oshkosh seniors can maintain their independence while living at home with the help of our reliable respite caregivers. Several companies make frozen whole-grain waffles that are easily prepared by putting them in a toaster. One waffle contains approximately 140 calories and provides 4 grams of protein. They are also abundant in vitamin B, calcium, iron, and phosphorus. Buttering the waffle with nut butter increases the protein value. Fill a plate or bowl with your loved one’s favorite greens. Add tomatoes, avocado chunks, hard-boiled eggs, cucumbers, carrots, and other healthy ingredients. If weight is a concern, go easy on the salad dressing or simply serve the salad plain. Consider hiring a professional caregiver if your loved one needs encouragement to eat healthier foods or requires assistance with daily activities. Some seniors only require help with a few daily tasks so they can maintain their independence. However, those living with serious illnesses may need more extensive assistance. Luckily, there is professional live-in care Oshkosh, Wisconsin, seniors can rely on. Home can be a safer and more comfortable place for your loved one to live with the help of an expertly trained and dedicated live-in caregiver. To learn about our comprehensive, high-quality elderly care plans, give Home Care Assistance a call at (920) 710-2273 today.